A hidden gem tucked away deep in the middle of the Indian Ocean, Sri Lanka truly has a lot to offer for the average traveler. Dotted with lush green jungles, sun kissed golden beaches, misty mountains draped with tea plantations and rich wild life, it’s amazing what a tiny mythical Island has to offer. Sri Lanka is the ideal destination for anybody who has a heart for the self-powered two – wheel machine. 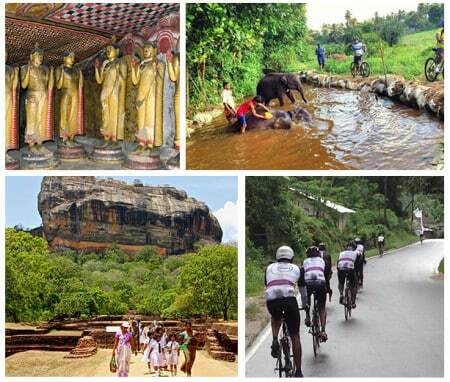 Cycle Sri Lanka and through a wide array of cultural sites experiencing the rich culture and heritage of Sri Lanka. Due to inter-monsoons, it’s best to avoid traveling within the months of May, June, July and August. The ideal period of traveling would be September to March. Authentic hybrid trek bikes are provided which are capable of handling mix road conditions both on and off roads. You will be accompanied by a micro van with a driver for the transportation along with a cycling guide to guide you through the terrain. Should you require rest at any point, a micro van is available at your disposal for resting. It should be noted that at some point, the roads are winding, steep and narrow where you are welcome to travel in the air-conditioned micro van instead of cycling. Arrive at the airport and meet the representative at the airport lobby and then proceed to Habarana.Spend the rest of the day at savoring the tranquil wilderness of Habarana. After an early breakfast proceed for an Elephant back safari. Elephant back safari in Sri Lanka brings in multifaceted joys. This Elephant back safari not only makes it possible to view wildlife from the back of an elephant, but perhaps more importantly provide the unique opportunity to share a day in the life of the elephant. It is the transit point of the large herds of wild elephants at the National Parks of Minneriya and Kaudulla. Cycle from Habarana to Polonnaruwa. Cycle and visit the historic site (Approximately 2 hours of cycling). Rising with the decline of Anuradhapura, the city of Polonnaruwa is a medieval capital and crown jewel of King Parakramabahu I and remains superior proof of the ancient culture and heritage blended with religious beliefs. Walk across its scattered walls of the World Heritage Site blessed by stupas, resting Buddha statues, irrigation canals and fantastically carved Hindu sculptures while observing the relic house, Watadage, which boasts of beautiful stone carvings. Take a close glance and you will realize a subtle Hindu influence on architecture and statues found in Polonnaruwa. Once the site is covered hop in the vehicle, enjoy a refreshing king coconut and head over to the hotel for rest and relaxation. After breakfast, cycle to Sigiriya. Difficulty level is easy. It is approximately 15 kms of cycling on mixed road and paved terrain, an estimated 40 minutes to reach Sigiriya’s entrance. Pack up the bike and hike up the Sigiriya Rock Fortress (3 hours of climbing). The 5th century rock citadel of King Kasyapa and World Heritage Site, Sigiriya, doesn’t only boasts of ancient Sri Lankan engineering and urban planning supremacy but also acclaims to be one of the finest monuments of art and culture. Step through the gigantic ‘Lion Paws’ overlooking the symmetrical royal gardens below to comprehend the absolute splendor that once dominated this rock fortress. Surrounded by ramparts and moats the Lion Rock resembles the mythological ‘City of Gods’ and is coated by frescoes that relate to Gupta style paintings found in Ajanta caves of India. Transfer from Sigiriya to the hotel and spend the rest of the day at leisure. After breakfast proceed to Hiriwaduna to experience the authentic Sri Lankan Village life. Trek for three hours through Hiriwaduna. The trek begins with a scenic walk along a bund of Wewa (man-made reservoir). The amazing birdlife, butterflies and possible sightings of crocodile only add to the charm of the trek. Sight the villagers as they go about their early morning tasks of fishing or washing clothes at the periphery of the lake. Enjoy the farmer’s humble hospitality. With the guidance of the farmer, pick some fresh vegetables from the plot and join in the preparation of a simple meal prepared in the traditional method using earthenware pots and firewood as fuel. After lunch go on a bullock cart ride. Transfer from Hiriwaduna to Minneriya National Park by vehicle and experience Minneriya Elephant Kingdom by jeep. Spread over 8800 hectares, this is a sanctuary for elephants. Minneriya is home to herds of deer and ample birdlife, but its spotlight remains the elephant. In fact, this is the largest elephant gathering in the world with sometimes over 700 at a time. After breakfast, proceed to Dambulla. Dambulla Rock Temple houses some of the most unique drawings in magnificently constructed 5 cave temples flanking the golden temple of Dambulla. Observe how exquisitely cave paintings are done along walls that shelter 150 statues of Lord Buddha. As you enter the retreat look straight up to the gigantic Buddha statue glittering in gold over a land which today houses an important junction in the country’s economic and cultural uplifting. Cycle to Matale Spice Garden and enjoy Sri Lankan spice specialties. Difficulty level is moderate. Cycle about 60 km on good roads. It is estimated to take about 3 hours to reach the Spice Garden. Hop into the Car and then get transferred to Kandy. Visit the Temple of the Sacred Tooth Relic of Lord Buddha. Enjoy a cultural show enhancing the rich and vibrant culture of Sri Lanka. After breakfast, cycle to Pinnawala Elephant Orphanage. Difficulty level is easy. Cycle approximately 50 kms and will take about 2 hours to the Pinnawala entrance. As you enter the 25acre coconut property, do not be surprised to witness baby elephants being bottle fed or moving around freely causing absolutely no harm to anyone. It is rightly a sincere sight to observe how these gentle giants orphaned and sometimes three-legged are taken care of since 1975 at Pinnawala Elephant Orphanage. Up to date, over 20 calves have been born here, and it is surprising to hear that some have even seen their grandchildren during the past few decades! Watch as they feed 9:15 am, 12:15 pm and 5:00 pm and take a river bath twice a day at 10:00 am and 2:00 pm. Transfer from Pinnawala to Peradeniya to visit the Royal Botanical Gardens of Peradeniya. After breakfast, proceed to Badulla by car. Cycle the hills of Ella. Difficulty level is difficult with breath taking views. Approximately 25 kms of cycling on steep hills, estimated 2 hours to reach the top. Ella is known as everyone’s favorite hill country village and the place to ease off the travel accelerator. This small town is used as a base for plenty of trekking expeditions to the surrounding countryside. A taste of the breathtaking scenery of Ella could be had, if you just walk into the Garden of the Grand Ella Motel (Formerly Ella Rest House), where you seem to be standing at the edge of the world and everything around you seems to disappear at your feet. Some of the places you could see in Ella are the Ella Gap, Ravana Ella Falls, Little Adam’s Peak and Bambaragala peak among the other many varied pleasant walks with stunning scenery. After breakfast, cycle through Ella Town and visit the breath Taking Rawana Falls. Difficulty level is Easy. Approximately 10 kms of cycling, estimated 25minutes. The famous Ravana Falls is considered as the widest waterfall in Sri Lanka. It is approximately 82 feet tall and casacades from an oval shaped concave rock out crop. Transfer to Ella Rock. Hike up to Ella Rock for spectacular views. the banks of Udawalawe Reservoir. Approximately 50 kms of cycling, estimated 3 hours on twisty terrain. Difficulty level is moderate. Udawalawe truly is a sanctuary for the elephants. Marked by relatively large herds of elephants, the national park proves to be one of the best places one could observe them in their natural habitat. Take a safari jeep and head into the park. You will also see other species such as potted deer, sambur, barking deer, water buffalo and jackal within the park. Udawalawe Elephant Transit Home bears a different story. Established in 1995, it caters to all injured elephants found in the area before releasing them into their natural habitat. So, make sure to just watch these gentle giants as they feed, play and mingle with each other before heading into the wild with one another. In the evening do a Jeep Safari, exploring the wilderness of Udawalawe. Visit the famous folk museum of Martin Wickramasinghe, the Sri Lankan writer. Afterwards visit the famous turtle Hatchery. Opened in 1996 to help promote responsible tourism, the turtle hatchery aids conservation by buying the turtle eggs from the fishermen. This goes a long way towards discouraging them from selling the eggs for the purpose of food or poaching. A visit here goes a long way towards helping save the lives of these wonderous creatures as they are kept safe until they are ready to be released. If you are lucky you can experience the joy of releasing these baby turtles back into the ocean and leave with the knowledge that you played a part in helping a species survive. After breakfast, cycle to the famous city of Galle. Difficulty level is easy. Galle, the epic Southern capital, is the intersection where classic Dutch architecture meets a tropical setting creating a vivid atmosphere in beauty. Walk the Dutch-haunted streets listening to the creaks of wooden saloon doors and observe how European architecture mingles with South Asian traditions today flooding cultural enthusiasts on a global scale. After breakfast proceed to Colombo by vehicle. Enjoy sightseeing of the city. Full day is at leisure in Colombo. After breakfast proceed to the airport for departure. Accommodation in double rooms on Bed & Breakfast basis. Tour starts with breakfast on day 2 ending with breakfast on day 14 at hotels specified or similar categories. Transport in a comfortable car. Cycling guide and backup vehicle (apart from the vehicle used during the tour) throughout the tour. Hybrid bicycles throughout the tour and sufficient beverages. Dambulla, Sigiriya, Polonnaruwa, Anuradhapura, Temple of the Sacred Tooth Relic (Kandy), Cultural Show, Peradeniya Botanical Gardens, Yala National Park and Horton Plains. Video Camera and Still Camera visiting different sites. Any other services not specified above. All Geringer Global tours can be personalized for you. Inquire to request a quote for this itinerary.